There's more to Christmas than a traditional turkey - especially if you don't need to feed an army of guests. Partridge with pumpkin, guinea fowl with orange and Szechuan pepper, or a couple of toothsome quail, sticky from the oven pan and eaten with the fingers are all recommended by celebratory chefs. How about chicken? Roasted with festive spices, a smaller bird is a feast in itself on the big day. Last year at this time the Bird Notes featured turkey. This year I thought I would look at the familiar chicken. The chicken is the most widespread domestic animal in the world. With more than 24 billion on the planet there are more chickens in the world than any other species of bird. 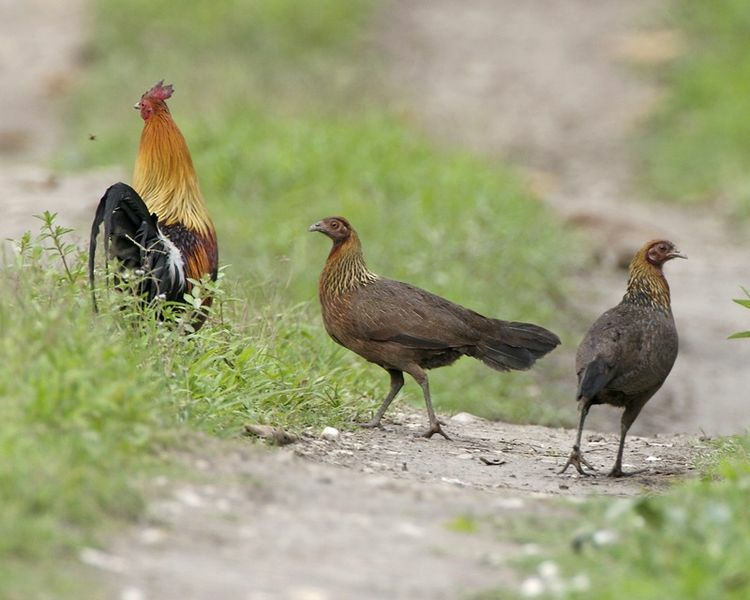 The wild ancestor is the red-jungle fowl which are found in south-east Asia, southern China and the Indian subcontinent. How did we get from the red-jungle fowl in one small corner of the planet to endless varieties of domesticated chicken that are readily available throughout the world? Here is the brief simplified version based loosely on archaeological evidence. There are 4,000 year old pottery figures and engravings of chickens from the Indus Valley and from China. Alexander the Great, whose armies invaded as far as the Indian subcontinent over 2,300 years ago, is attributed with bringing chicken to the classical world. They were first depicted in monuments in Egypt around that time. From Greek and Roman sources the main spread of domestic chickens westward took place in the last 500 years of the first millennium BC and it is suggested that it was the Romans who brought them to Britain. From the first millennium onwards, chicken are found on most archaeological sites in Europe. The spread into sub-Saharan Africa seems to have been on the east by way of Egypt in the first millennium AD. In West Africa the earliest known finds are from a site called Jenni-jeno in Mali around 500AD. Man spread chickens east also onto the islands of the Pacific with chicken present in some Polynesian islands from 4, 000 years ago. That eastward spread of chicken continued so that when the Spanish and Portuguese Conquistador arrived in South America in the fifteenth century, people were already keeping chickens! The red jungle fowl lays a large clutch of eggs and will continue to lay if some are removed. That tendency has been enhanced under domestication. Ancient Egyptians knew chicken as the "bird that lays every day". As chickens became important as a source of meat rather than eggs, more were slaughtered while still immature. This is exemplified in the city of Exeter, where only 11% of chicken bones from the Roman period were immature while in the Middle Ages this almost doubled to 20%. Whether it's turkey or partridge or guinea fowl or quail or goose or chicken or nut roast or whatever you are planning to eat during the festive season, have a good Christmas.